My current work and research is focused on the possibility of what a feminist form may consist of beyond current feminist content, imagery, and histories. Through sculpture, performance, video, and sound, I perform a visibility that, in normative patriarchal society, is preferred to remain invisible. The question of feminist form transcends the product and is inclusive of my practice and methodology. In doing this, a slippage occurs where the separation of studio activity and domestic responsibility is blurred. In the performance In Balance With, my six-year-old daughter, Chloe, and I sit at opposite ends of an empty sixteen-foot seesaw. 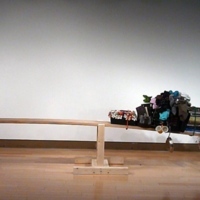 During the thirty-minute performance, I add items that represent our lives such as toys, her books and sketchbook, my research books, food, laundry, tools, and pots and pans to her side of the seesaw. Constantly checking in with her well being, I continue until both sides have reached equilibrium. While hovering in a balanced state, I am continually counteracting her every move. Here we remain until she is ready to come down. In communication the entire time, the words we share are available to the audience but are not for the audience. This piece is the confluence of many of my ideas. It relays and relies upon the non-privileged, unspoken language of the maternal, the process as opposed to the product, and the repositioned domestic dialog. 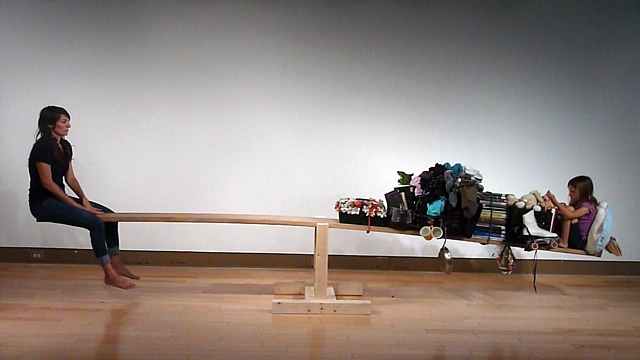 When the performance ends, what remains is a laden seesaw complete with identifiable objects representing one’s life: a sculpture that tells a tale. The non-hierarchical triad of feminism, language, and maternity forms the unique basis for my work. The French feminist Luce Irigaray describes woman “as waste, or excess, what is left of a mirror invested by the (masculine) ‘subject’ to reflect himself, to copy himself”1. I use language as a medium in my work to represent the gap in both “meaning” and “intention,” as well as the notion of “excess” as Irigaray connotes. How does the methodology I will use be sympathetic to feminist form? How will my decisions be based on this? Feminist form is non-hierarchical. It has options and choices; it is excess and multiplicitous, not singular. It will not be categorized, but create it’s own category. It is a process that is not based on product. It accumulates and is messy, but is not interested in making messes. It is an invitation, not a statement. “Courtney Kessel,” Artist Parent Index , accessed April 22, 2019, http://www.artistparentindex.com/items/show/27.